STEP 1: Get a bowl is that about 10 inches in diameter. STEP 2: Cover the top with a plastic film (like Handi-wrap). Pull the film tight across the top in all directions till it is flat and smooth. STEP 3: Sprinkle some salt onto the top of the film. STEP 4: Get a pot and spoon. 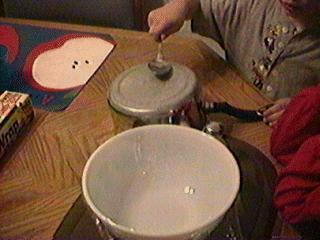 Bring it next to the bowl and strike the bottom of the pot hard to get a short, loud, sound. 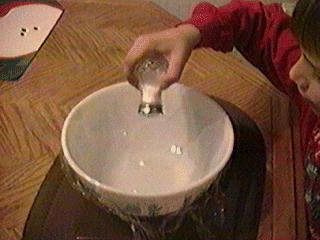 STEP 5: Notice that when you strike the pot the salt jumps. If you can get close enough, and yell loud enough, you can get the salt to jump just from the vibrations of your voice. What's happening? When you strike the pot it vibrates. The vibrations are transmitted through the air, to your ear and also to the film. The film vibrates too and sends the salt crystals jumping into the air. When you use your voice, your vocal cords do the vibrating. Copyright Lee Krystek 1993. All Rights Reserved.